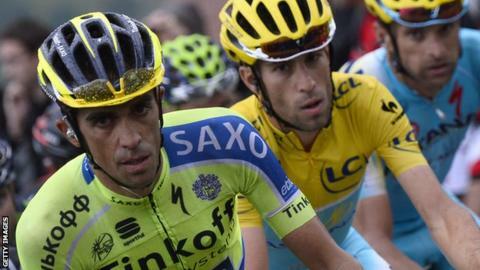 Spain's Alberto Contador has won the 2014 Velo d'Or, cycling's rider of the year award. The Tinkoff-Saxo rider, 31, succeeded Britain's 2013 Tour De France winner, Chris Froome. It was his sixth Grand Tour title, having also won 2007 and 2009's Tour De France, plus the Giro d'Italia in 2008. The awards are organised by French cycling magazine, Velo. Britain's Bradley Wiggins won the 'Golden Bicycle' in 2012 - and Contador himself took the award in three consecutive years from 2007 to 2009. Contador was stripped of his 2010 Tour De France and 2011 Giro d'Italia victories after testing positive for banned substance clenbuterol.